Good binding help can be hard to find. This is Krissi. Kind of a worrisome week, but good for me personally. I got back to my step aerobics class, and am happy to say that my bionic knee feels better than the one that’s still original. Great to be back! 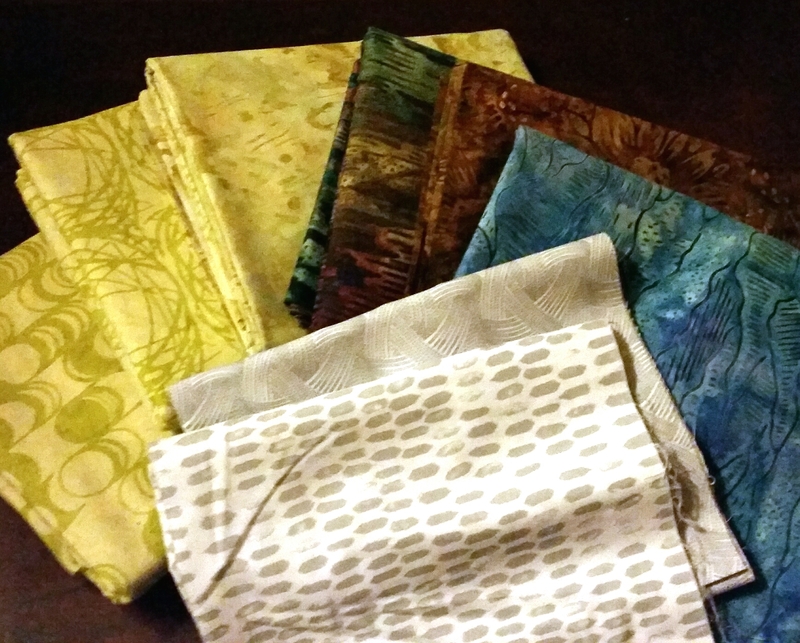 I didn’t buy any quilting fabric. I was bitten by the garment sewing bug, so I bought some knits for tops. Pictures later if they turn out. The only finish was this commissioned baby quilt, using three and a half yards. 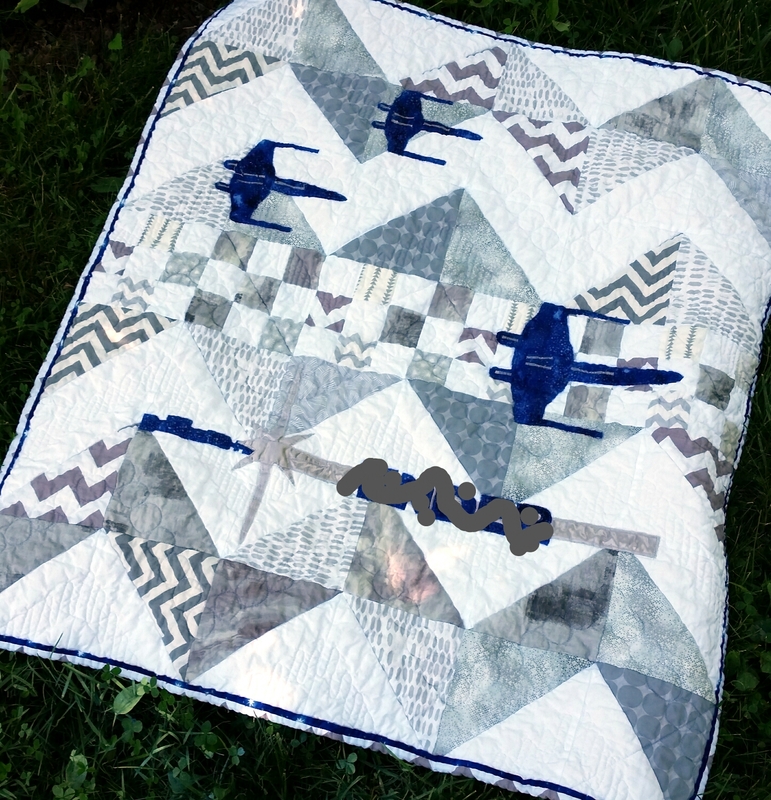 I think this is the seventh one of this design I’ve made, starting with the Elephant Quilt in 2014, then adding the Star Wars version last year (thanks to a client who had this vision). So it went pretty quickly. That isn’t pink under the baby’s name, but a patch of sunlight. I did get very tired of the stickyness from Steam a Seam Lite 2. Yuck! My needle was a mess. I guess I’m going back to Wonder Under. Any other suggestions? Keep using your stash. I’m linking up to Sunday Stash at Patchwork Times. Hello, on the last day with the palindrome date! With all the fitting from project to project, I had only one tiny finish. That zipper pouch had only about an eighth of a yard of quilt fabric in it, so I’m not even counting it. At least I didn’t buy anything! I did finish fifteen heart and fifteen butterfly blocks for #OrlandoLove quilt. 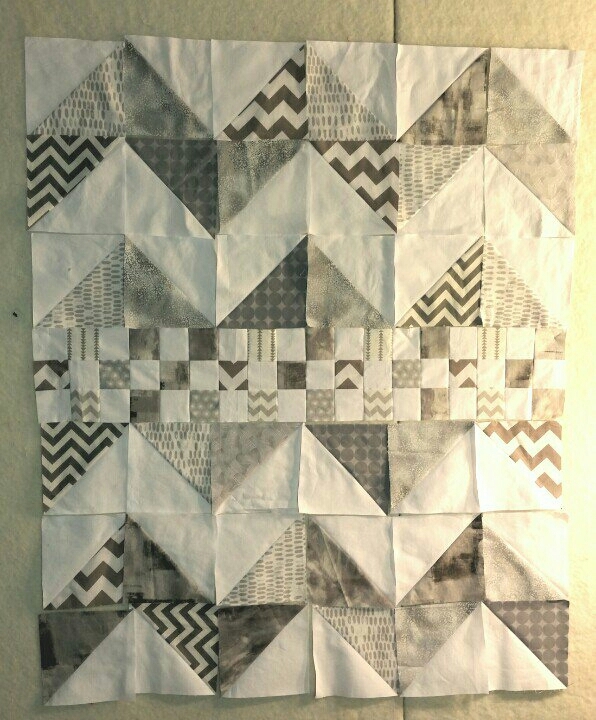 Then I got a baby quilt commission, and the top for that is pieced, so the finishes will come! Hope you’re using your stash. I’m linking up to Sunday Stash at Patchwork Times. 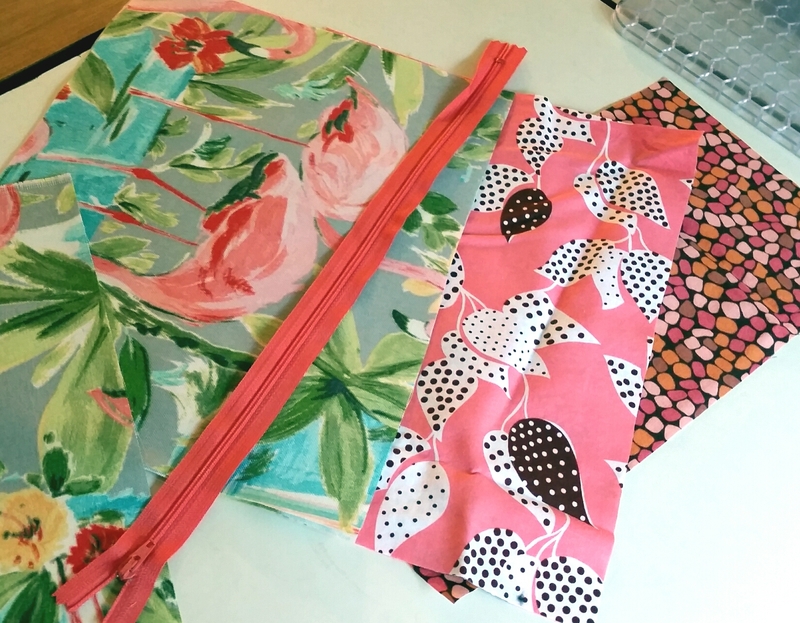 Yesterday I finished the little pouch to keep me from dropping my stuff all over the Y. I used the Open Wide Zippered Pouch tutorial from Noodlehead. I didn’t use her measurements, though. I think I cut my pieces about 7″ by 6″. And I added a strap by which to carry and hang it. I’m not sure you could tell these are flamingos if you didn’t already know, but it’s colorful, anyway. I used Pellon fusible fleece for interfacing, and it stands up well. I also added inside pockets. There is a very good reason the pattern doesn’t have pockets. They don’t work with this construction method. Well, because I’ve made pouches before, I figured out how to sew around them, but it added time to what should have been a very quick project. Maybe if they were just sewn into the lining they would work, but I wanted them sewn all the way through the layers. Probably shows my lack of bag-making experience. But don’t do it if you’ve never made one before. This is a nice, simple, cute pattern without them. One pocket is for my Bluetooth earpiece, and the other is for hairbands. Then in goes my phone and Y card, and maybe my wallet. I’ll be so together no one will recognize me! Hope you’re finding time to sew! Categories: Finishes, Uncategorized | Tags: Evening in the Garden, pouch, Valerie Root | Permalink. 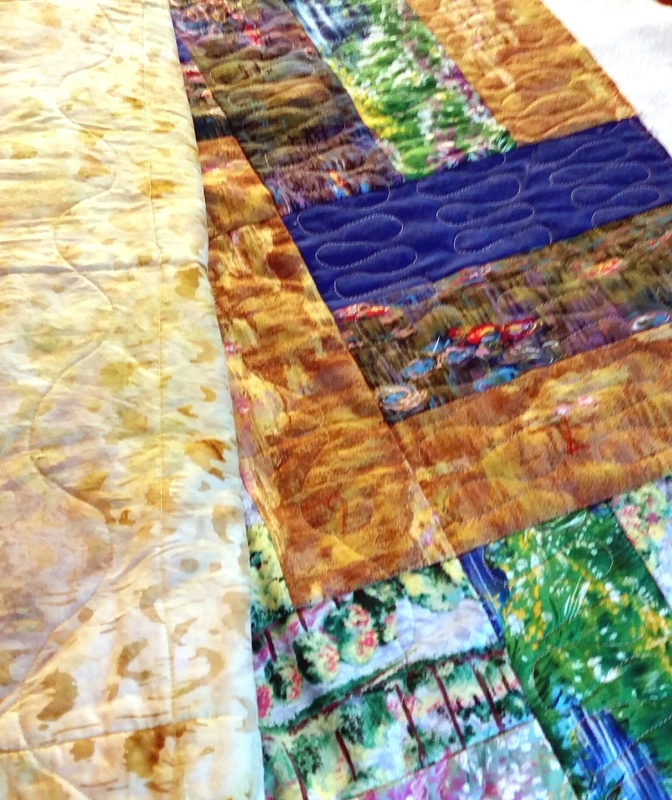 I started this week quilting this quilt made from the Impressionist style fabrics. Another few hours should finish it up, and then I’ll post more about it. 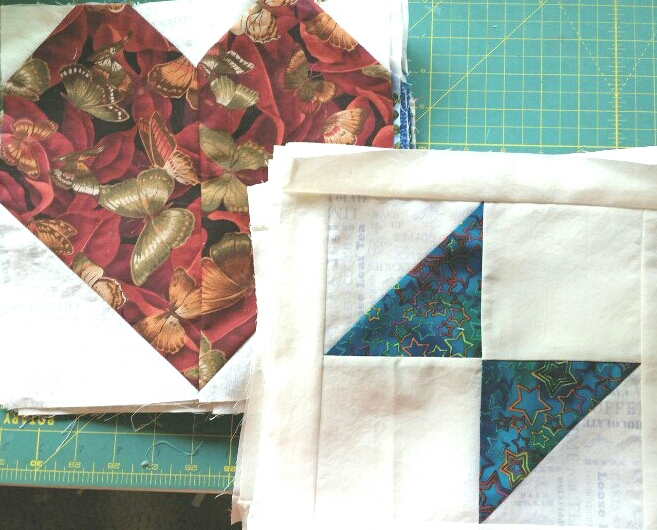 Yesterday, I put that quilt aside to cut fabrics to make heart blocks for a quilt for Orlando survivors and families. This is being coordinated by the Orlando Modern Quilt Guild. There’s a new post today with details and the address, and yes, just blocks are also welcome. They’re using this tutorial from Cluck Cluck Sew. At the gym this morning I dropped my Bluetooth earpiece AGAIN and narrowly missed having it stepped on AGAIN, and finally decided it was time I stopped juggling my little pile of keys, phone, earpiece, and Y card, alongside my water bottle. So I moved the heart blocks off the cutting table and cut some fabric for a little zipper pouch. 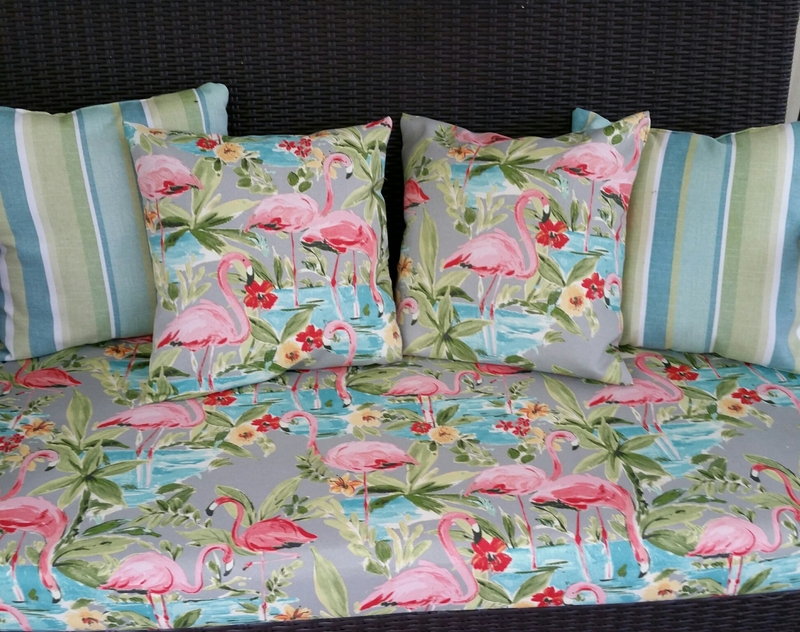 Yes, that’s the &#$% flamingo outdoor fabric that I fought with to make the deck cushion and pillows. But I had large scraps still lying out, and I feel like it should stand up well to being kicked into the corner of the aerobics room and hung from the elliptical machine. So far, so good. The lining is the last of my Flea Market Fancy in a pretty peachy-pink. So, I’ll finish up this pouch and get back to the heart blocks this afternoon. At least it’s relatively cool here and my studio is habitable. What do you have in progress? Categories: Uncategorized | Tags: Evening in the Garden, Orlando, Valerie Root | Permalink. 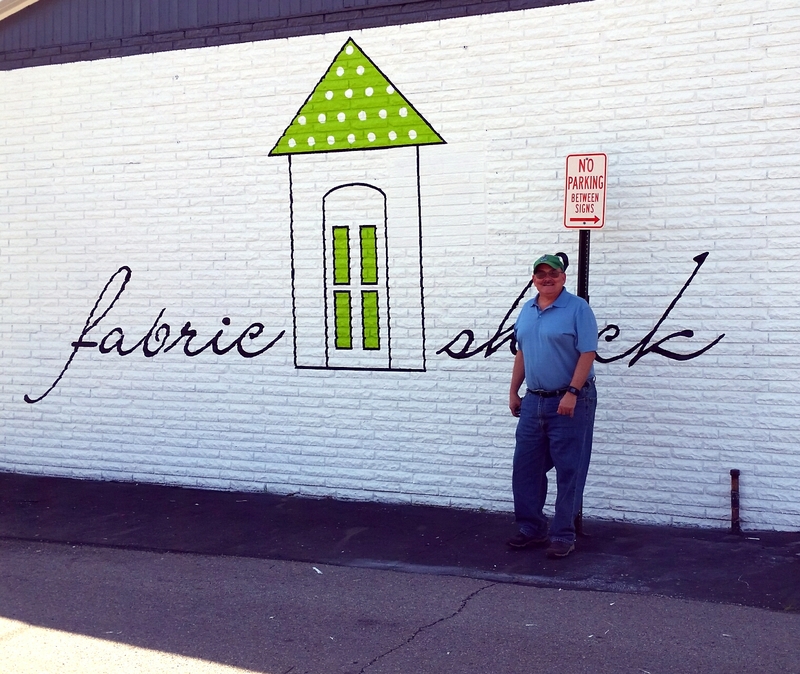 Yep, I went to Fabric Shack this week, so the numbers will be out of whack for a while. I had to buy it, really, because it was in my June Goals to get border and backing fabric for a WIP. This week I recovered the seat cushion for our outdoor settee and made a couple of pillow covers from the scraps. That wasn’t from the stash, though, it was stiff, surly outdoor fabric with which I’m glad to be finished. 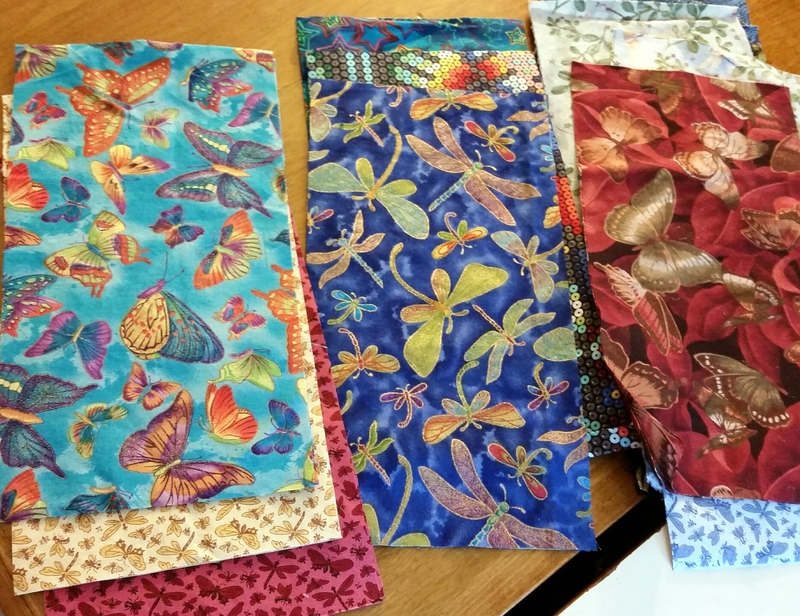 The only quilt fabric used was three quarters of a yard for the eight donation blocks for Kat. Keep watching as I use those backs! Keep using your stash, even if you have to shop to do it! I’m linking up to Judy’s Stash Report at Patchwork Times. Categories: Stash, Uncategorized | Tags: Evening in the Garden, Valerie Root | Permalink. I’ve worked on several things this week, but the only finish is the Black and White Stars quilt, using 3.5 yards of long stashed black and white prints. Thanks, everyone, for all the love for that quilt. It was lots of fun and im very happy with the result. I didn’t bring any fabric into my home this week. But I may have ordered…some. I’ll come clean on that next week. Keep sewing and keep using that stash. 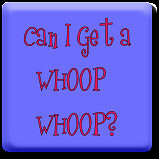 I’m linking up to Judy’s Stash Report at Patchwork Times. Yesterday I finished the Black and White Stars Baby Quilt. This was a quick, spontaneous little quilt just because I came across that pile of fabrics in my stash. I liked making the wonky stars enough that I may do another project. 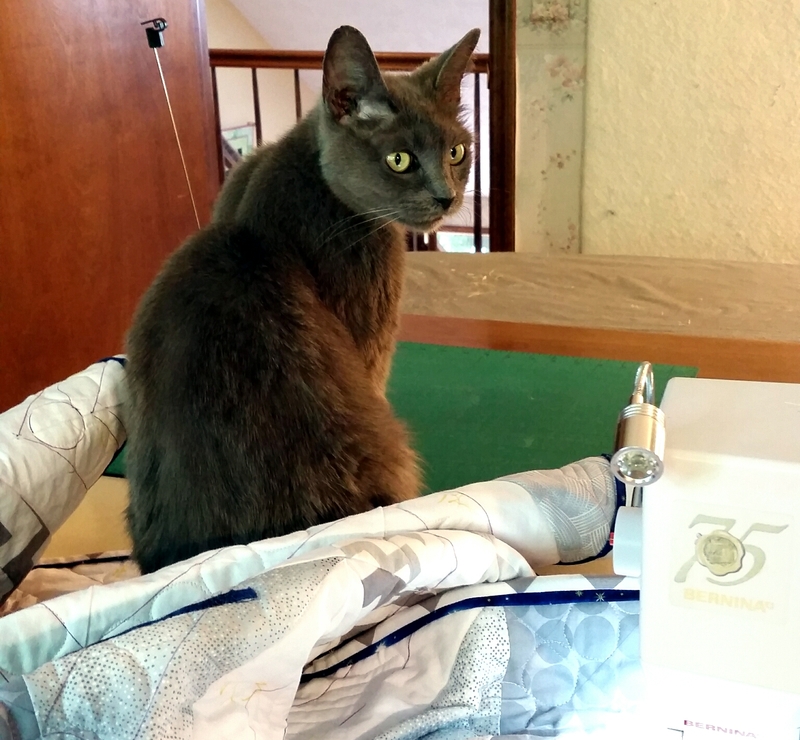 The binding is a little different: I matched it to to value of the quilt. Usually, I would contrast it to act as a frame, but I didn’t want any more busy-ness on this one. I used a total of eight different black and white prints (six on the front, plus two additional on the back), as well as black and white Kona solid. I tried a new (to me) batting. It is thicker and heavier than Warm and White. It was not more trouble to sandwich or quilt, but I do think it shows off the quilting a little better. And it produced a very snuggly quilt, as you can see. Hope you’ve had some great finishes lately. I’m linking up to Whoop Whoop Friday at Confessions of a Fabric Addict, and to Let’s Make Baby Quilts at Michelle’s Romantic Tangle. 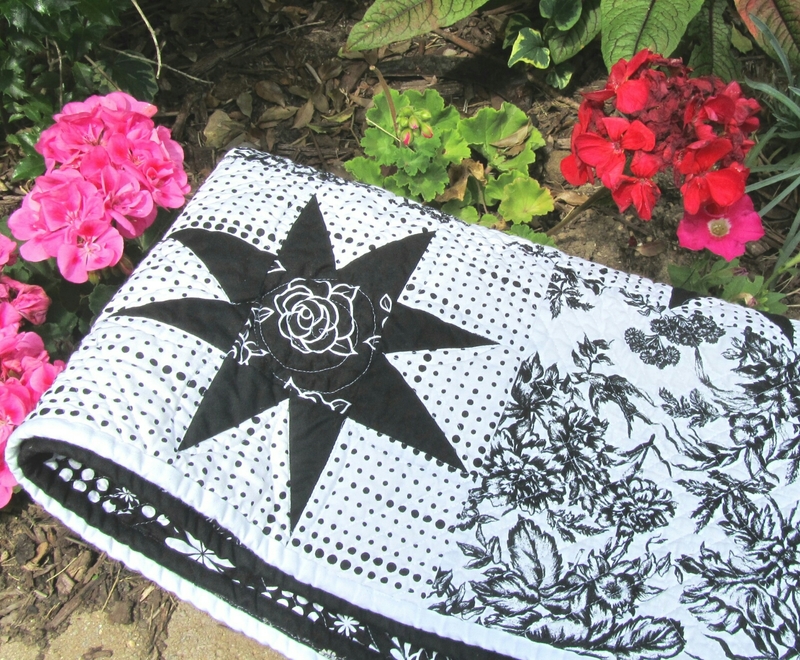 Categories: Finishes, Uncategorized | Tags: baby quilt, black and white baby quilt, Evening in the Garden, Valerie Root | Permalink.